It has been a quiet day here at the Blue Angel. We have stuck close to home, not leaving at all except to take a walk which was not that pleasant as the ships were in and there were people beginning to pour out through the terminals and the shop venders were set up and ready to sell and wanted us to spend one hour only to listen to a talk about a time-sharing thing, I guess, after which we would be rewarded with free tequila and a day's free rental of a jeep. "No, gracias," we said, over and over again as we strolled. We checked out places we might want to snorkle when the water truly calms down and we saw a few iguanas sunning themselves on rubble and rock. just a few steps away. Here's what I had for breakfast. 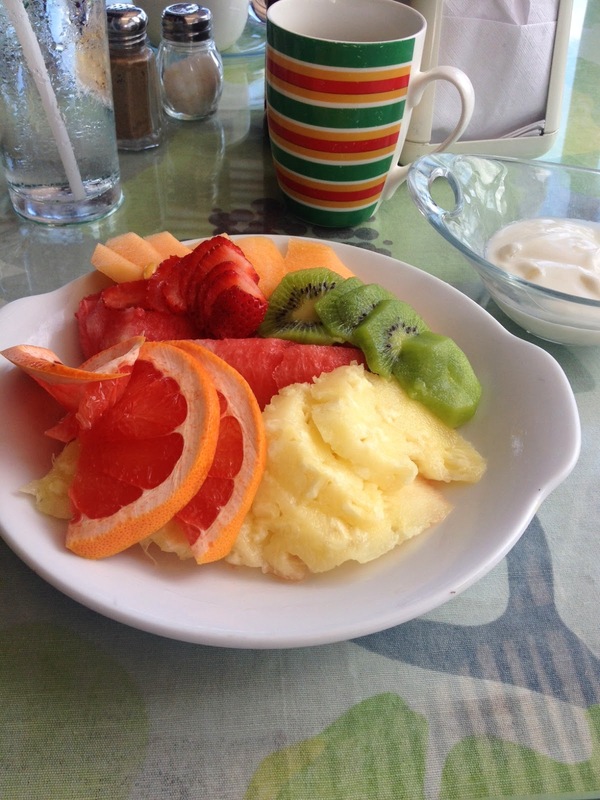 Grapefruit, pineapple, kiwi, strawberries, watermelon, cantaloupe. And delicious vanilla and honey-flavored yogurt. I sat and looked at the water and slowly ate and it was a sort of heaven for me. I will be quite honest with you- a large part of my enjoyment here is the food which is always fresh and unprocessed, and usually eaten in the most pleasant of surroundings, slowly and with great appreciation on my part. Because I do cook most of our meals at home, it is the largest gift to me to have someone else cook my food, and someone else to serve it and clean up after. Our server this morning was the youngest of the servers, a mere boy whom I am ready to adopt right this second. His name is Elmer, as strange as that may sound, and he is just pure sweet. He has no qualms about placing his hand on a shoulder, man's or woman's, and this is the way the people are here. When the cook came out at lunch to talk to people and introduce herself (Marta) she too, after speaking to us, put her hand on my back, gave it a little rub. Here's the lunch she made me. If that is not the most perfect of perfect meals, I do not know what is. 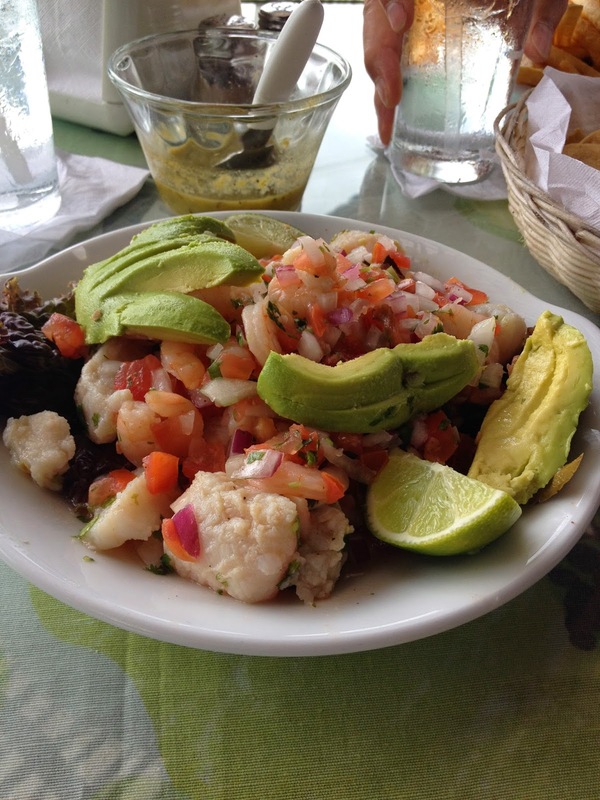 A ceviche of shrimps and fish with tomatoes, onions, peppers, lime juice, salt, cilantro. Avocados and limes on the side. That was the small platter and thank god I did not order the large. You have fat, you have protein, you have citrus, vegetables, you have heaven. I love this island. I love these people. I love their sea and their ways on it in the panga boats they build and use. I love their gentle humor, their patience, the pride they have in this place, their home. At sunset, it is not unusual at all to see the employees making their way to watch it along with the guests. Speaking of guests, some new people moved in next door a few hours ago. They must be from Texas or Louisiana, judging from their accents. One of the men sounds so much like Jase on Duck Dynasty I literally had to get up and walk past him on an invented excuse to make sure it was not. It wasn't but damn, vocally, he could be him. I think this is my favorite place on the island we have ever stayed with the possible exception of the old Plaza Las Glorias which has been turned into an all-inclusive. This place has a charm all its own and the lovely funk of form and function which you find here. If one needs a light fixture, one does not run down to the Lowe's or Home Depot. 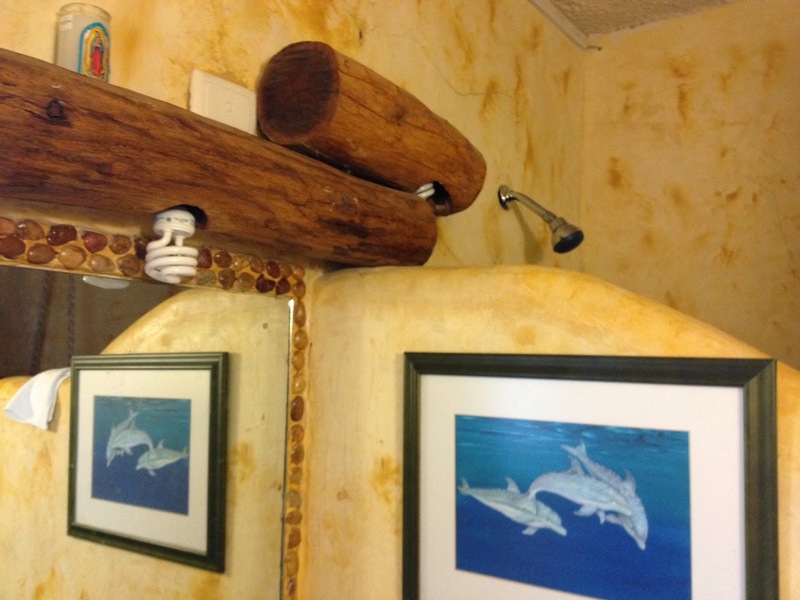 One may make one's own with two pieces of log, peeled and smoothed and lacquered, holes drilled to put light bulbs in. Or, perhaps, a large calabaza shell, again lacquered, with holes for the light from the bulb to shine through. I love this one which is over the bed. 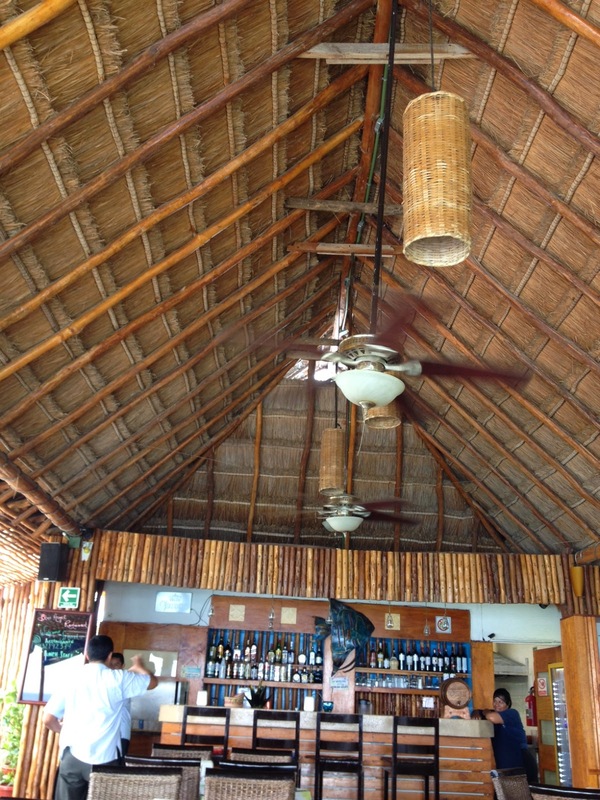 The form of the palapa never ceases to amaze me. 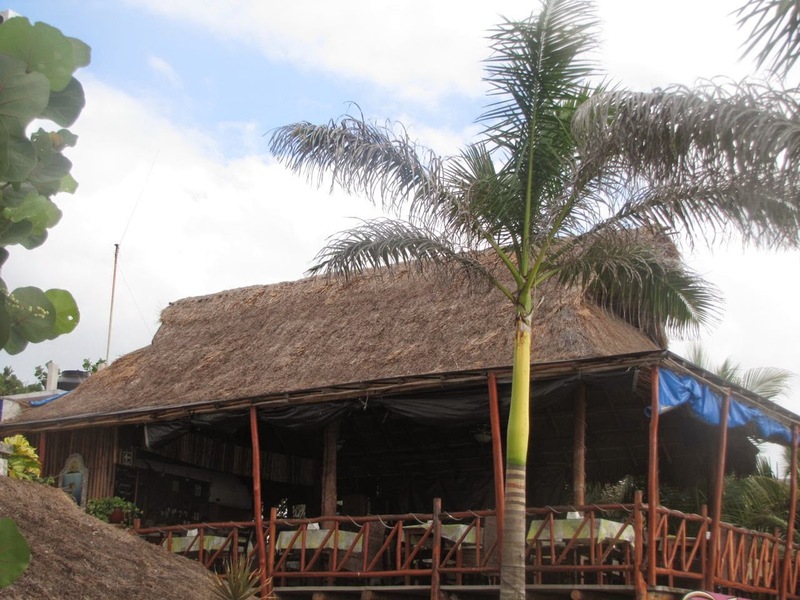 A design which is thousands upon thousands of years old, made from palm fibers and wood, it is strong enough to withstand high winds and rains. It is a thing of beauty and the people who create them are, in my mind, true artisans. Well, it is getting on towards sunset. Mr. Moon has driven the scoot into town to check out the weigh-in from the fishing tournament and here I sit, writing this, watching the dive boats come in, the people wet and happy from their dives, the tanks clank on the cement as they unload them. The wind has died down considerably and perhaps tomorrow we will snorkel. We made the conscious decision to lay low today because in my experience, it is always the third day in which the most adjustments must be made, whether of the psyche or the gut and so it has been, but it has been the most easy of adjustments. We have walked, eaten, napped, fooled around, and now it is this part of the day. I think I will go take a shower and wash my hair and sit here and let it dry and wait for my husband to come home and for the sun to set. We will go into town for our supper. I can barely wait. But I will be happy to come back here too, walk through the pretty lobby, say hello to the nice people. Oh wait, Mr. Moon has returned and reports that he saw a six-hundred pound marlin as well as a bunch of bare-butted women in thongs. The Sol girls, they may have been. "Did they have big chi-chi's?" I asked him. He did not want to admit that he had truly studied the situation but he can't fool me. "I'll let you see the pictures," he said. Nothing wrong with a nice thonged lady-rump and nothing wrong with pretty chi-chi's either and the day he quits looking at them is the day I truly begin to worry. P.S. I have finished Larry McMurtry's The Last Kind Words Saloon. It is not one of his epics but it is a small jewel of dialogue and spareness, character and sense of place. I would love to read it out loud. Each chapter is very short, a tiny delicious bite, sharpening the appetite for the next one. I have handed it off to Mr. Moon. Everything looks and sounds very, very healthy. Each bit of it. Well, again. It sounds divine. Sounds terrific! That shrimp dish looks especially great. 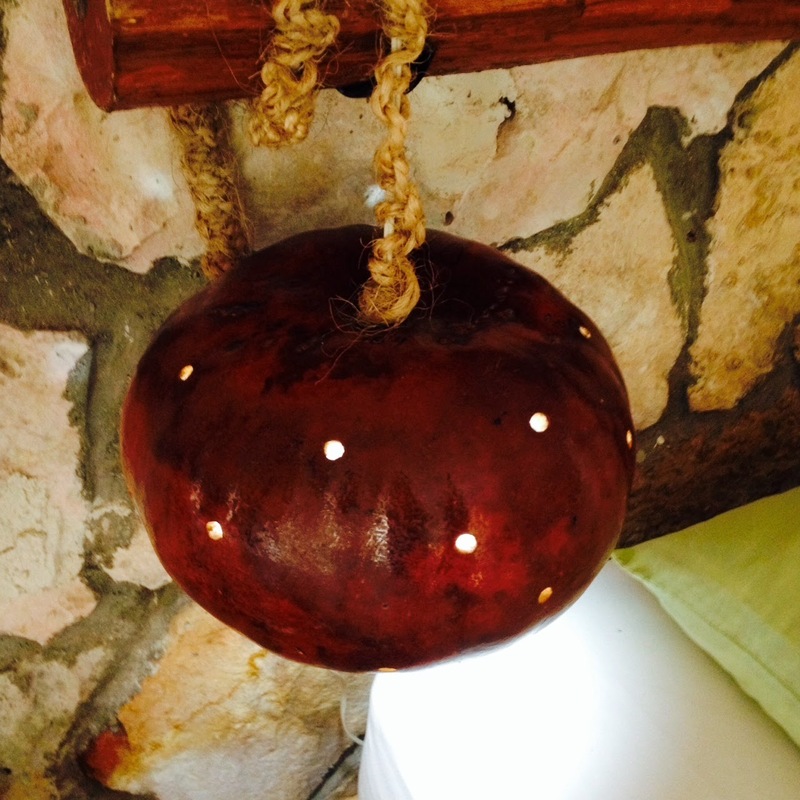 And you gotta love a lamp made from a gourd. What a wonderful place. I am envious! Sounds wonderful. We are going to explore further downtown. Spanish lessons this morning and the gym. Like your relaxing.